Discover the perfect nursery rocking chair for you, with a gorgeous range of nursery chair styles below. Complete your nursery with the ultimate stunning design and set up a cosy corner styled exactly how you please. Offering everything you need to nurse comfortably and in style, this selection includes chairs that are built to the highest standards of quality. 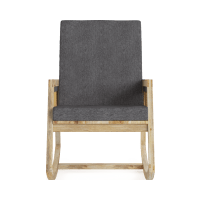 Made from carefully hand picked materials, the nursery rocking chairs have a dense foam filling and soft cushioned back and arm rests so you can sit back and relax. Brosa's selection of nursery rocking chairs are built with sweeping silhouettes and strength tested wooden frames, providing a gentle rocking motion that will soothe as you sit. Each nursery rocking chair is upholstered with the low maintenance and high quality fabrics, including Brosa Signature Premium blend, or Australian made Warwick Mystere velvet for a luxuriously soft touch. Take you pick from a range of colours, from bold and bright to neutral and natural. Match your nursery rocking chair with an equally on-trend bed or side table, as well as a stylish ottoman for the perfect place to rest your feet.